The following document summarizes outcomes and lessons learned from an exercise conducted in May 2012 by the U.S. 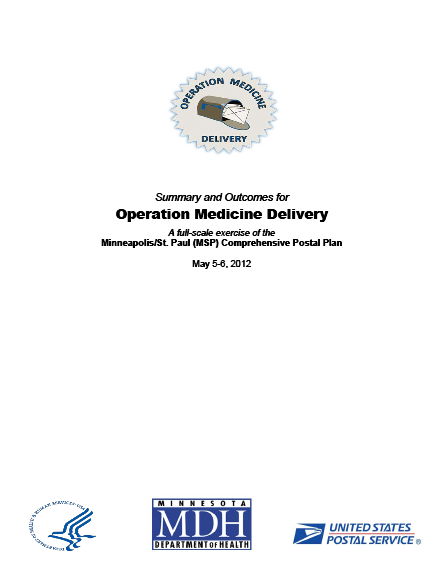 Postal Service and the Department of Health and Human Services in conjunction with the Minnesota Department of Health called Operation Medicine Delivery. The exercise was the first test of the National Postal Model for the Delivery of Medical Countermeasures in the event of a biological attack. For more information on the exercise, see Carlton Purvis’ article for Security Management magazine. On May 5-6, 2012, the Minneapolis-St. Paul area conducted a major test of the National Postal Model for distribution of medicine to the public in an emergency, using U.S. Postal Service assets to supplement mass dispensing sites and other strategies. The May exercise, known as Operation Medicine Delivery, was the culmination of planning efforts that began in February 2004, with a memorandum of agreement signed by the U.S. Secretary of Health and Human Services, the U.S. Secretary of Homeland Security and the Postmaster General. Parties to the 2004 MOA agreed to make USPS resources available for distributing emergency medicine in response to a bioterrorist attack. A subsequent presidential executive order (December 2009) called for the development of a federal capability to distribute medical countermeasures (MCM) in response to a bioterrorist attack. In February 2010, work was completed on the Minneapolis/St. Paul (MSP) Comprehensive Postal Plan, a blueprint for implementing the Postal Model in the Twin Cities area of Minnesota. A tabletop exercise (TTX) of the MSP Comprehensive Postal Plan was conducted in January 2011. Operation Medicine Delivery was conducted as a full-scale exercise (FSE) of the plan. The MSP Comprehensive Postal Plan was the first such plan in the nation, and OMD was the first full-scale exercise of the Postal Model. The concept had previously been tested, on a limited basis, in Boston, Philadelphia and Seattle. • Demonstrating the ability to establish and maintain an effective system for communicating with the public during an incident requiring activation of the MSP Comprehensive Postal Plan. • Demonstrating the ability to alert, activate and assemble the necessary personnel, facilities and equipment to distribute simulated preventive antibiotics to residential mailing addresses in four Twin Cities ZIP codes. • Testing the process for assembling law enforcement personnel involved in implementation of the MSP Comprehensive Postal Plan, and coordinating their activities with those of USPS personnel. • Assessing the ability of exercise participants to activate and secure facilities used to receive, break down, distribute and dispense simulated supplies of preventive antibiotics. • Testing the process for recovering and handling any undelivered supplies of simulated preventive antibiotics, and demobilizing postal operations that were activated in connection with the exercise. • Testing the ability of exercise participants to maintain appropriate command and control over exercise activities, and maintain effective internal channels of communication, as described in the MSP Comprehensive Postal Plan. • Clearer description of command and control structure in the plan. The overall command and control structure for the MSP Comprehensive Postal Plan, including the integration of local command elements, needs to be defined more clearly. • Authority to reallocate and demobilize delivery teams in the field. Four different command entities had responsibility for the delivery teams – the Postal Emergency Operations Center, delivery unit managers, law enforcement command centers and law enforcement sergeants in the field. Greater clarity is needed regarding who has authority to reallocate (reassign) or demobilize the delivery teams. • Clarification of terminology used to report completion of delivery routes. Issues related to reporting terminology created uncertainty regarding the completion of routes and affected the ability to quickly redeploy delivery teams to other routes. • Lack of a process for reallocating delivery teams following route completion. Lack of a defined process for reallocating teams after they had completed their assigned routes delayed reallocation of teams to new routes by as much as 40 minutes.